Published September 19, 2012 By Anna T. This post may contain affiliate links. Regardless, I only recommend sites I've researched and/or used and trust. 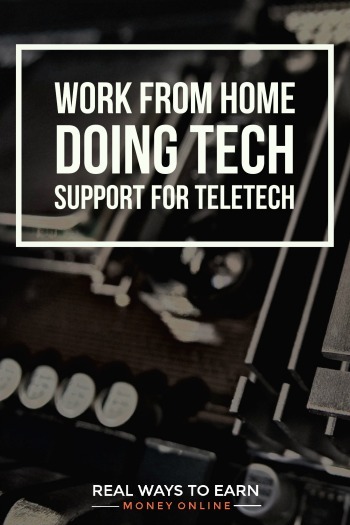 TeleTech is a company that is hires people to do work from home customer support for a variety of different major corporations. Please note that TeleTech is only currently hiring in 41 states. In this TeleTech review, I'll do my best to explain how it works based on the info I've gathered so far. As I'm sure you've guessed, you're doing phone support work for this company. This means you'll be doing either customer support and/or sales. The work is done from your home and the company claims that they are flexible with scheduling, so hopefully if you are hired you can get shifts that work for your schedule. There is a training period to go through before you start working to ensure you know how to do the job. They also assign you a team leader you can access via IM to help you out if you run into problems during your shift. The pay rate you will receive at TeleTech is not listed on the website because it will vary depending on what project you're on. However, the reading I've done online on the forums indicates that most people earn anywhere from $8 to $9 an hour. You are paid bi-weekly and the money will come to you either through direct deposit or something called a Comdata payroll debit card. TeleTech hires you as an employee of their company, not an independent contractor. This means you will be paid for your time spent in training and that they will take taxes out of your pay. TeleTech is one of those jobs where you don't have to have a land line phone as long as you do have a Voip system that does not connect to the internet. But of course a land line is acceptable to use. You also need a PC, high speed internet, and a quiet work space. Be warned that if you are using anything older than Windows 8.1, they will not accept you. To apply, you'll have to fill out the online application, check your computer for their system requirements, and answer some assessment questions. If you do not pass the assessment tests, you'll have to wait 60 days to apply again. If you do pass, you can schedule an interview that will take place over the computer and/or phone. You will find out the results of your interview within a few days and from what I understand they will give you an offer with how much they are offering you in regard to pay, and then you decide whether or not to accept. If you do accept, you'll have to undergo a drug test and criminal background check. TeleTech pays for these things although they will not reimburse you for your gas mileage for driving to a facility to get a drug test, etc. A minimum of 20 hours a week is expected, broken up into shifts consisting of four to six hours. Weekend and/or holiday work might also be required. This can be flexible to a point because during the offer process, you can let the recruiter know when you are available to work and then they will try to get you set into a schedule around that time period. If you would like to go ahead and get your app in, you can begin the process here. Trying to Find More Legit Work at Home Jobs? I previously accepted an assignment, and began training, but ran into a problem with their supposed 24 hour technical support. There was never any answer at the 1-800 number given to me for 24 hour available technical support, so, no, I wouldn’t recommend Teletech. I am writing with a complaint about this company. I have been without over a year, since my lay off from my previous employer and in my city, state called Lake Charles, LA you cannot find jobs and stay without work for years. I am only stating the truth, no matter how hard you look for work and I am a widowed, lady and it is terrible that I am treated this way, as I am sure other people would be. I was supposed to be hired by TeleTech in doing work from home jobs and was supposed to be in training on March 17, 2014. I had went through everything, the drug test, back ground check. I called each day to make sure they would have me for a sit in the class, even bought head sets for this job. I was told to have everything like the software running on my computer and headset bought. I have been without work and who can afford these items? I did what I was asked to do, then next thing the class was cancelled and I was told they do not know when I will be considered for training again. I was upset when I had heard this and believe me, this has not been the first time I have been set up for jobs with some employers let down. This company, promised me two months advance that they would put me in training before the new year’s holidays and had all their software on my computer, than deleted it, then second time it happen again. I have one thing to say, I am a college student and trying to become a teacher and do not have time for the games. i have to make a living like other people and a widowed, lady who needs an income. I feel that if someone didn’t know that they could push the training class in the first place, why make me go through all this. If there are workers wanting to know about this company, I am telling the truth and they will have you do alot of things to waste your time and money, no training.. Good Luck.